Lots of travel plus a flu has combined to keep me away, but I'm back to say Happy New Years! I hope everyone has been enjoying the holiday season. I spent a lovely wedding weekend in DC, then onto Boston through Christmas, then to sunny Sarasota, and finally back to Durham for New Years. We used this recipe for our evening punch, in case you're interested. Bourbon Review listed out their top bourbons under $30. Last minute present, anyone? Like the homemade trees above? 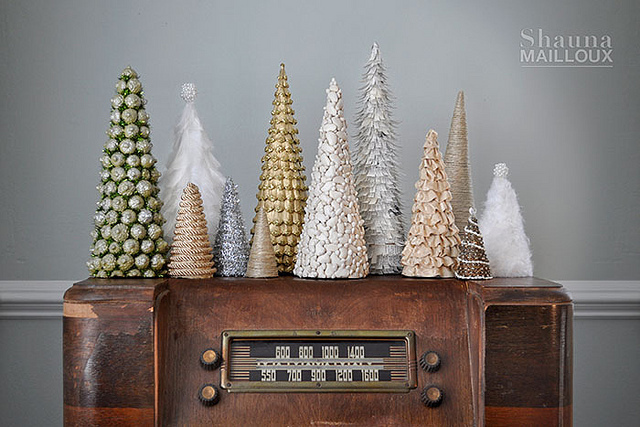 I love the neutral color palate, and that they're more winter themed than holiday, so you can keep them up longer. Get some directions from Beautiful Matters here, here, and here. Ooooh em gee this satirical final episode of serial is hilarious. We watched Frozen on Christmas Day, so I found this list timely. Tarzan is voiced by Fitz from Scandal??! Ever notice how Trader Joe's and Whole Foods are often right next door to each other? DC has this in triples, but the Washington Post has this helpful guide on which is right for you.